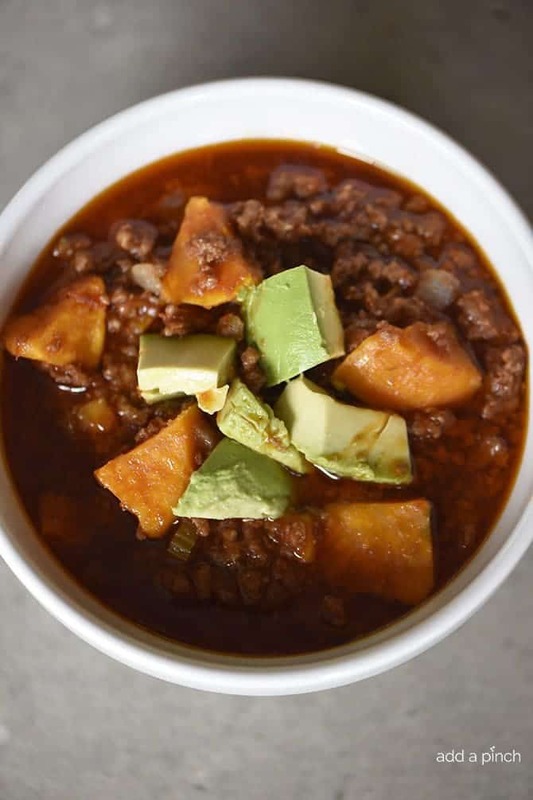 This Instant Pot Sweet Potato Chili makes a hearty, delicious chili recipe in minutes! 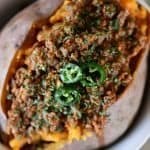 Made with ground beef, sweet potatoes, and packed with flavor! 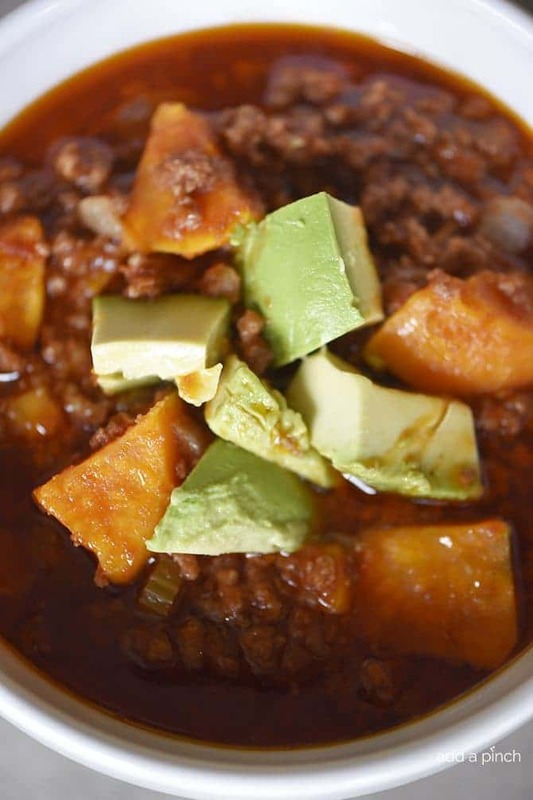 If you love chili as much as I do, then I think you are going to absolutely love this sweet potato chili recipe. Made in the Instant Pot, it tastes like it has been simmering away on the stovetop all day even though it is ready and on the table in less than 30 minutes! I love recipes like that! Don’t you? To make it, I add olive oil to the interior pot of my Instant Pot set on the saute setting. Then, I add in my diced onion and saute until the onion is just tender. Then, I add in my garlic, ground pork and ground beef. 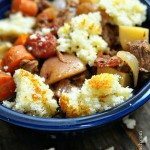 I love the complexity of the pork and ground beef in this recipe, but you can certainly just use ground beef. 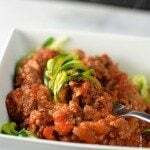 You can also substitute the beef with ground turkey, if you prefer. Once the meat has been browned, I add in my sweet potatoes. It always amazes me how quickly they cook to absolute perfection in the Instant Pot! Then, I stir in the celery, crushed tomatoes, Worcestershire sauce (or coconut aminos if you are following a Paleo or Whole-30 lifestyle), cumin and chili powder. 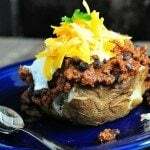 The chili is flavorful, with tender pieces of sweet potato and just the right amount of spiciness so that everyone can enjoy it. Of course, if you like a spicier chili, add a little more. I always like to have a container of chili powder on the serving table when I serve my chili so that people can add more to their individual liking. Allow Sweet Potato Chili to cool completely and then portion into freezer-safe containers, removing as much air as possible. Store in the freezer for up to 3 months. 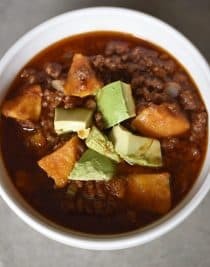 Here’s my Instant Pot Sweet Potato Chili recipe. I hope you love it! Set the Instant Pot to the Saute setting. Add olive oil to the interior pot, followed by the diced onion. Saute until tender and then add minced garlic, ground pork, and ground beef. Cook, stirring frequently, until the pork and beef are browned. Add sweet potato, celery, crushed tomatoes, Worcestershire sauce, cumin, and chili powder. Stir to combine well and situate the top onto the Instant Pot. Set the Instant Pot to 10 minutes of High Pressure using the Manual setting. Allow to release pressure naturally and then carefully release any additional pressure before removing the top of the Instant Pot. Serve the chili with any additional toppings desired. Add olive oil to a Dutch oven set over medium heat. Add in the onion and cook until tender, about 3 minutes. Then add in the garlic, pork, and beef. Cook, stirring frequently, until the pork and beef are browned. Add the sweet potato, celery, crushed tomatoes, Worcestershire sauce, cumin and chili powder. 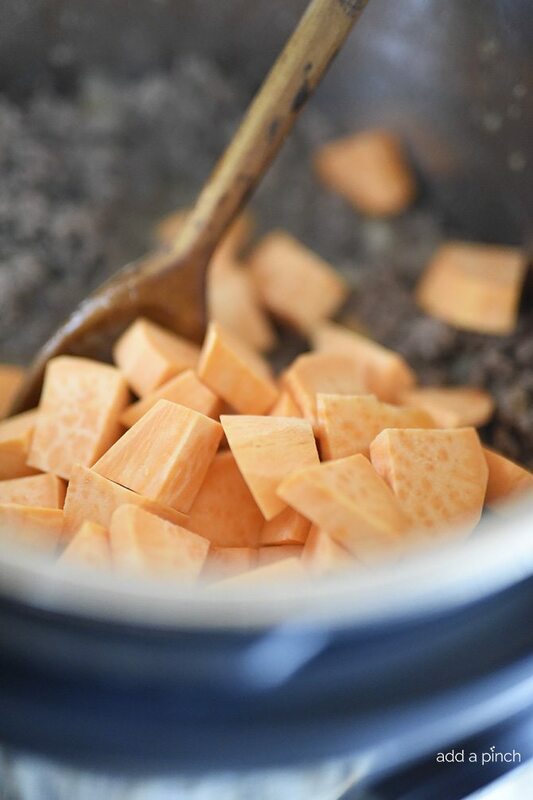 Stir to combine, cover and allow to simmer until the sweet potatoes are fork tender, about 30 minutes. Serve with toppings. What a wonderful way to make chili, especially when it’s cold outside! I agree, Ruth! Nothing like have hearty chili when it is cold outside! An Instant Pot is a brand of pressure cooker. This is delicious – I hope you enjoy it! Thanks! I thought it was just a little on the bland side, so I added some Chipotle sauce after the fact. And I might’ve used a little more sweet potato and cooked it just a tiny bit less or done something so the sweet potatoes were a tiny bit less soft. Love the idea though! Love this! Easy recipe & tastes great! I add a few shakes of Frank’s RedHot to mine! Thanks for sharing! Thanks so much Kel! Glad you liked it! This recipe looks delicious! 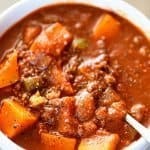 I don’t know why I’ve never thought about adding sweet potatoes to my chilli!! I don’t like my chilli very spicy so good thinking to have the chilli powder on the table for others who may want their serving spicier! I bet kidney beans or any beans would be a nice addition! Great recipe! I made this last night and it turned out amazing!!! So flavourful! Thank you for this recipe. I left out the celery and the cumin (not a fan) and I added a bit more sweet potato. Just lovely!! This was my first instant pot recipe, ever! I can’t believe how soft the potatoes got! Great recipe- thank you! I loved this recipe! Perfect Whole 30 meal that my whole family loved. And bonus for using the Instant Pot! So happy you and your family enjoyed it Angela! 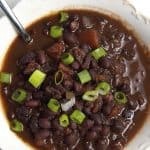 Isn’t it helpful to make it so easily in the Instant Pot?! Thanks so much! Sorry this may be a silly question Robyn ( I’m a rookie instant pot user ),but you don’t drain the grease from the meat? This looks delicious and easy to make!! Thank you! Very easy to put together after work and feel good about feeding my family! It also froze well and was a hit a work time lunch. My co-workers all commented on how great it smelled! 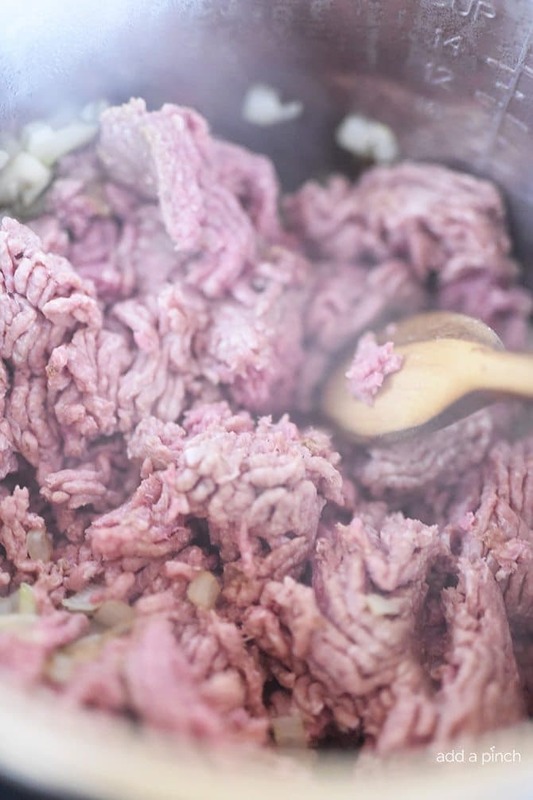 I needed a quick recipe to make from frozen ground beef. I thawed the beef in the microwave while I prepared the vegetables for saute. I did not have crushed tomatoes on hand so substituted a jar of marinara sauce and 2 cans of diced tomatoes. That worked out great. The seasoning is good, although I am generous with it to suit our tastes. This will be repeated. 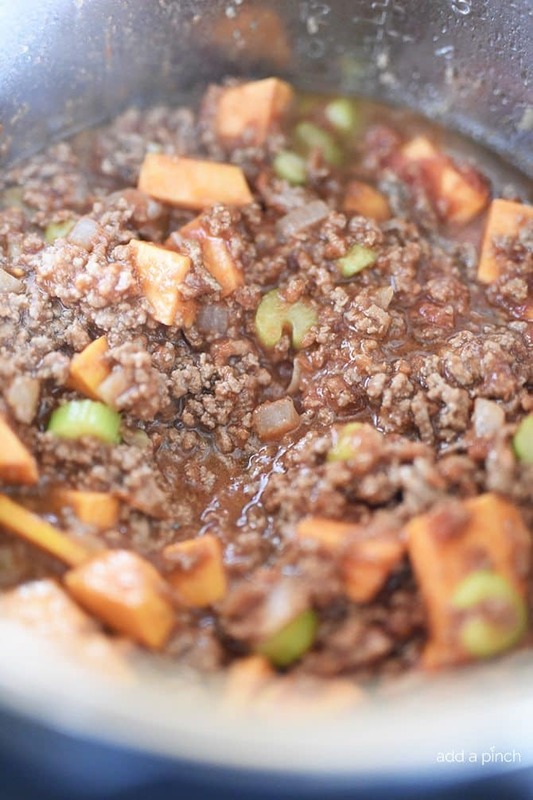 I love the combination of ground beef and sweet potatoes. Thanks for having an Instant Pot recipe available to meet my needs. When you say allow to release pressure naturally – how long do you leave it for? Most other recipes I’ve used have said how long to natural release for before opening the vent. I’m excited to try this recipe…! Very tasty, love the spices used, and I used ground Turkey to lessen the points of my WW points. Loved the easiness of using one pot. Winner, winner, Turkey chili. Yum! This chili is amazing! We make it all the time! I freeze it in individual portions perfect for lunches. Thanks, Caron, that is a wonderful idea!